All the flavours of The Holidays in a brownie, these make a fabulous gift. Pop into a lovely tin and treat your family or friends to something really special. Combine 100g of the dark and all the milk chocolate in a heatproof bowl. Add the butter and melt together carefully in a microwave in 20 second bursts or over a pan of simmering water. Stir until smooth and combined and leave to cool slightly. Add the sugar, vanilla and beaten eggs to the melted chocolate and butter, stir to combine. Sift both of the flours and cocoa powder into the bowl and mix until smooth. Add two thirds of the ginger, clementine zest, 80g of the cranberries and the same of the white chocolate and pecans stir. Then spoon into the prepared tin. Spread level with a palette knife and bake on the middle shelf of the preheated oven for 25 minutes. Brush with a little of the ginger syrup for an extra ginger kick. Leave to cool in the tin. Pop into the fridge and chill for at least two hours. Melt the remaining dark chocolate in a disposable piping bag in a jug of boiling water. 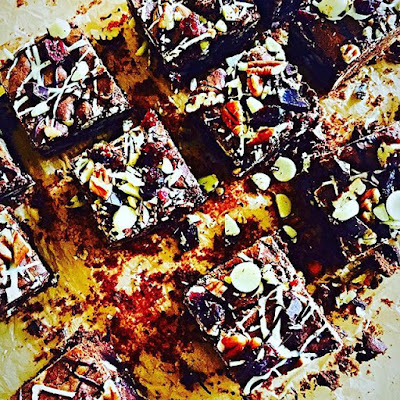 Once it's melted snip off the end and drizzle in an even layer over the cooled brownies, sprinkle with the remaining pecans, cranberries,ginger and white chocolate then cut into squares, then devour. *For an extra ginger kick brush the warm brownies with a little syrup from the ginger. *These can be frozen pre-decorated for up to two months.